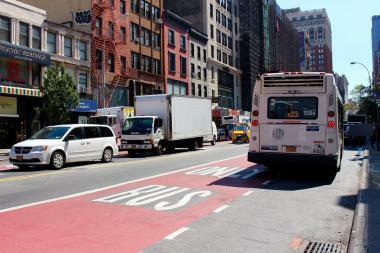 One of the new M23 Select Bus Service lanes on West 23rd Street, between Sixth and Seventh avenues. CHELSEA — Designated bus lanes have arrived in Chelsea as the city prepares to roll out Select Bus Service on 23rd Street. Bus-lane painting for the crosstown M23 route “is under way,” and the city’s Department of Transportation expects to wrap up the job by the end of the month, a spokesman said Wednesday. The service will launch “later this year,” when the MTA finishes installing fare-collection machines on the street, a DOT spokesman and an MTA spokeswoman said, without providing a more specific time frame. Like existing M23 buses, M23 Select Bus Service buses will travel back and forth between Chelsea Piers and the Stuy Town loop. The stops that M23 buses will make when Select Bus Service rolls out. The dedicated lanes will extend from 10th Avenue to Second Avenue for eastbound buses and from First Avenue to Eighth Avenue for westbound buses, a DOT spokeswoman confirmed. For stops beyond those points, buses will return to regular road lanes, she said. Bus stops along the existing route at Fifth Avenue and 23rd Street and at Lexington Avenue and 23rd Street will be removed when Select Bus Service goes into effect, but all the existing stops in Chelsea will be preserved, the DOT spokeswoman confirmed. The MTA had planned to eliminate an existing stop on East 20th Street between Avenue C and First Avenue, but backpedaled when Stuy Town residents and politicians protested.